So I prefer Hot wheels/Matchbox when it comes to my diecast tomfoolery. Nothing against other brands or scales, it’s just convenient price and space-saving wise. The amount of 1/18s I have can be counted on my fingers, and the ones I’ve personally grabbed for myself the fingers I’d count with would be on one hand. The last 1:18 I got was actually last Christmas (a Porsche GT3 from Bbruago) as a gift, but the last one I got on my own terms was a Maisto Saleen S7. It’s been so long I forgot when exactly I got it. So this limited-edition Ford GT from Miasto isn’t just a paycheck splurge. It’s an event. And one that I’m very happy with, even if it isn’t flawless. Lemme show you everything. Right off the bat this model has alot of similarities to it’s 1:1 counterpart, and the first I noticed was the weight. This is probably just me not playing around with 1:18s enough to know what they’re like, but the first thing I notices was how light this model is. Very little heft at all. The real Ford GT is known for, among other things, it’s lightweight build of just a hair over 3,300 Ibs. But now here comes the first issue, which is honestly just me being pedantic but still. The exterior mirrons on the 1:1 GT are asymmetrical. The passenger side mirror is further away from the front of the car than the driver side. This is because the seats in the GT are fixed, and the mirrors need to be off like this to provide the best visibility. A bit annoyingly, Maisto didn’t take this detail into account as you can see here on this pic. Another inaccuracy only a sad, sad nerd like myself would notice can be seen here. In the rear of the 1:1 GT you’ll find the controversial “Ecoboost” TTV6, and right behind it a trunk space, big enough for maybe a gallon of milk. The front bit can open but all you’d find there is fluids and some mechanical witchcraft. Maisto didn’t have any time for that. Behind the engine is just a flat space, and the front opens where there’s just an open cavity. This model’s lucky it’s pretty. The suprisingly big butterfly doors don’t open as much as I think anyone would like, but I don’t keep my bigger models open when I display them so I don’t mind that much. What I did mind (in a good way) is what I could see of the interior. I paid little over $40 (not including shipping) for this so I gotta say, the interior on this is pretty nice. Good details with the white trim, the displays on the dashboard and central console, bits on the steering wheel. All pretty nice and accurate. ....and the body pushes down on the wheels, instead of the axle snapping. This probably isn’t anything special for this scale but I enjoyed it. Now I kinda wish this model could drop it’s ride height down and raise it’s spoiler for track mode like the 1:1, but if it could there’s not way I would be paying $40 for this. One last thing before I wrap up here; my god the paint on this model. It’s almost as beautiful as the metallic red with white stripes you can get the 1:1 in (but nobody does in 1:18. Dammit). It looks good in these photos, but seeing it in real life is something else. If there’s one part Maisto knocked out of the park it’s the paint for sure. To finish things up, I’d say for $40 it was totally worth picking up this casting of one of my favorite cars in recent times. It doesn’t do a flawless job of replicating the real this but damn if it doesn’t come close. 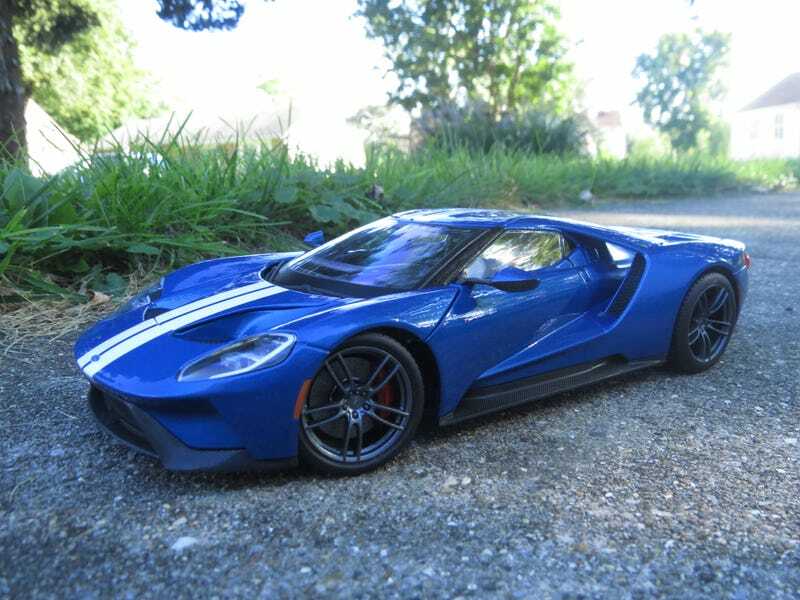 If you love the ‘17 Ford GT as much as I do and want a big, affordable model of it to display and occasionally pretend to powerslide on your desk, look no further.